How much more efficient could your business be, if your helpdesk was available over the web 24 hours a day, 7 days a week? 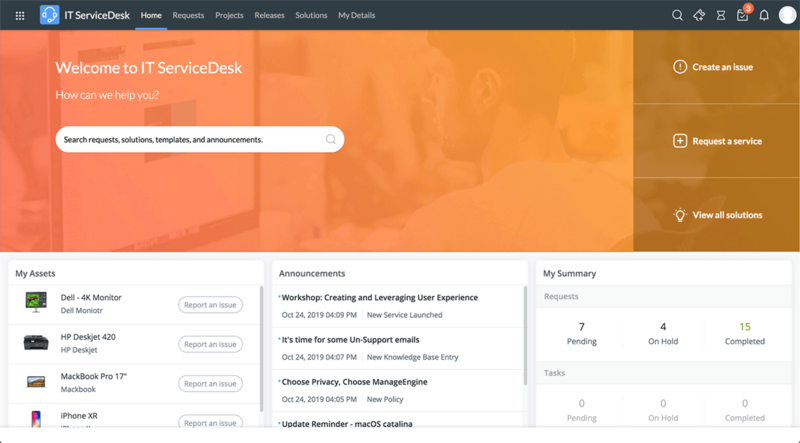 ServiceDesk Plus is a web based help desk that gives you 'open all hours' functionality. Users can choose to call or email through their support requests AND they can even raise their own requests. 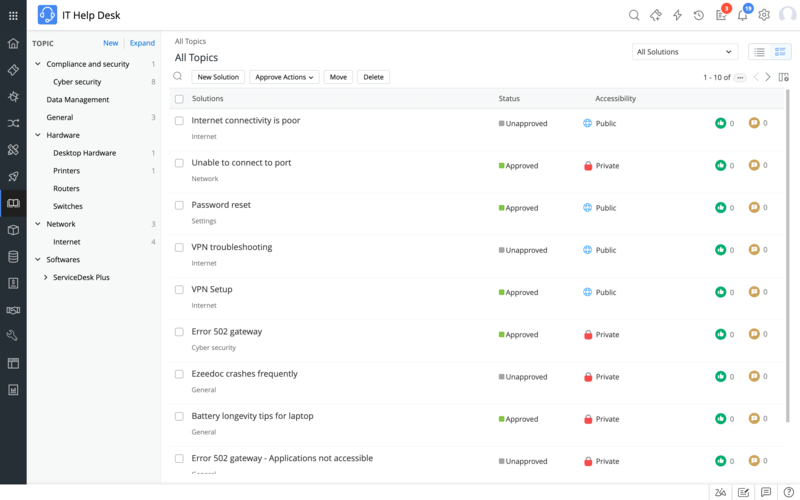 ServiceDesk Plus allows you to create, manage and track all help desk incidents from one single place. 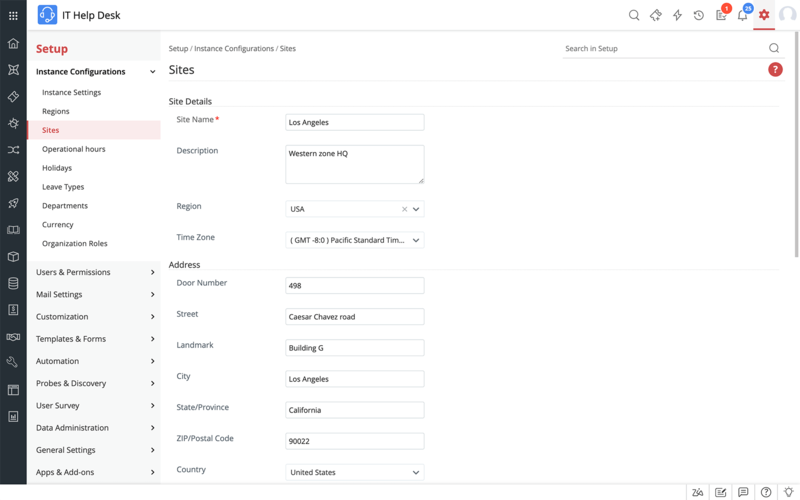 Incidents can be created automatically via email and even assigned automatically using a set of defined rules. This is one powerful web based help desk that is going to save you a lot of time in administration. The system is easy to install and implement and so simple for end users to access. Not only can users create their own incidents - they can also track them through to resolution. That means 'chase up' calls are greatly reduced because users can see incident updates as they happen. ServiceDesk Plus offers help desk managers the right set of features that are simple and easy to use. It helps them focus on winning user's satisfaction without having struggle with technology and tools. The web based help desk has a self-service portal that allows users to raise their own support requests. Imagine how much this could free up your technical teams or help desk staff. Not only can users raise their own tickets, but they can also track the status of their tickets reducing the number of 'chase up' calls received by your help desk. You can also keep users informed of planned and unexpected outages through the self-service portal. Learn more..
By creating a comprehensive knowledge base of common problems, you not only help your technicians to solve problems, but you can help your users to help themselves too. A good knowledge base can reduce turnaround times and improve user satisfaction levels dramatically. Learn more.. If you are inundated with support requests coming through by email, ServiceDesk Plus has the answer. 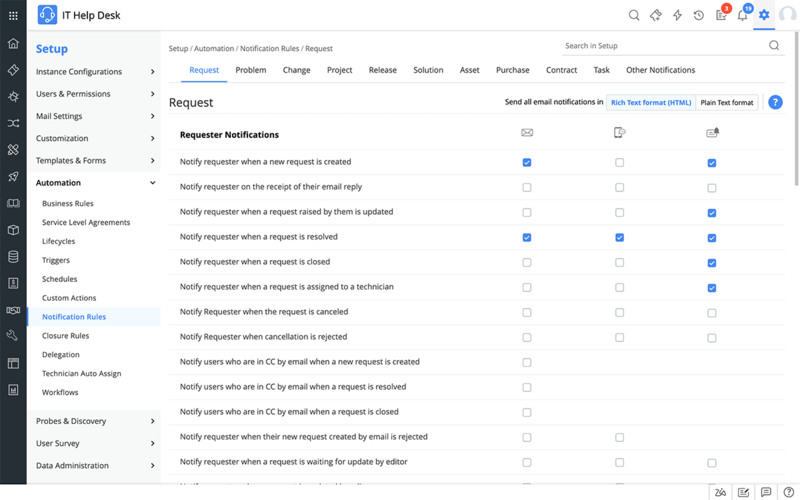 ServiceDesk Plus is so intuitive that it can turn an email into a support incident automatically - no more copying and pasting from email into your help desk tool. And all support incidents can be tracked by users using the self-service portal. Learn more.. Many organisations have branch offices spread over a wide area and often worldwide. ServiceDesk Plus allows you to manage all assets and incidents across your entire organisation regardless of geographic location. Learn more..
SLAs help your technical teams to be more efficient in order to meet SLA targets. 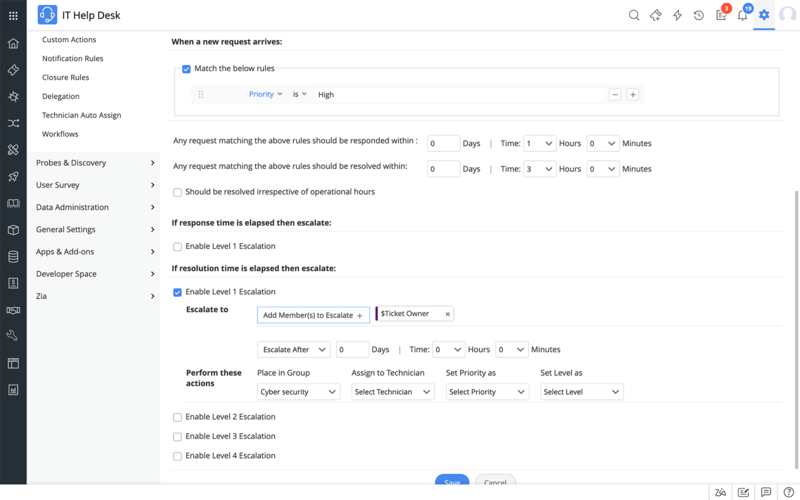 ServiceDesk Plus allows you to define and manage SLAs to ensure compliance with these targets at all times. You can also define escalation levels should an SLA be breached using your web based help desk solution. Learn more.. 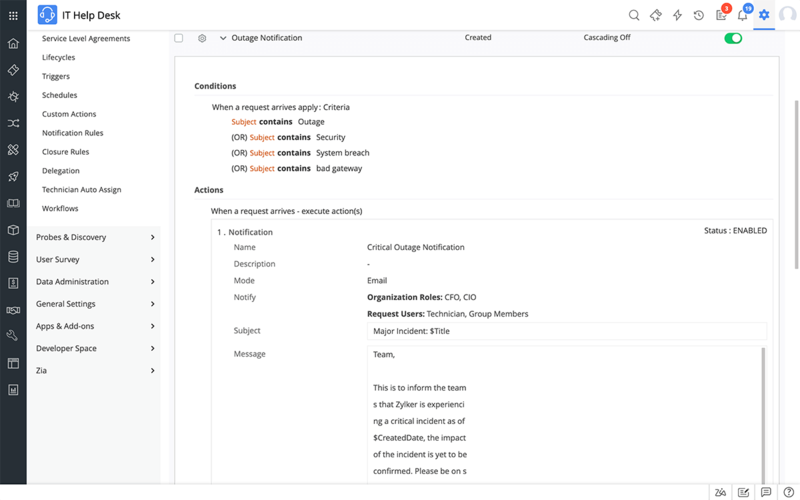 The API integration feature in ServiceDesk Plus allows seamless integration with any compatible third party software allowing you to manage events created elsewhere. Learn more..
Now you can automatically assign tickets to technical teams and individuals based on the Business Rules you create. This could mean up to 70% of requests arriving through your web based help desk are assigned without any human intervention. That makes for some serious time saving. Learn more.. Notification Rules allow you to send out confirmation receipts to users so that they know their support request has been received and is being dealt with. These receipts can be set to send at the time a support ticket is created, when a change is made within a ticket or when a ticket gets assigned to a team or individual. A notification can also be set to send if SLA rules are breached. Learn more..
Reports allow you to get up close and personal with your web based help desk. 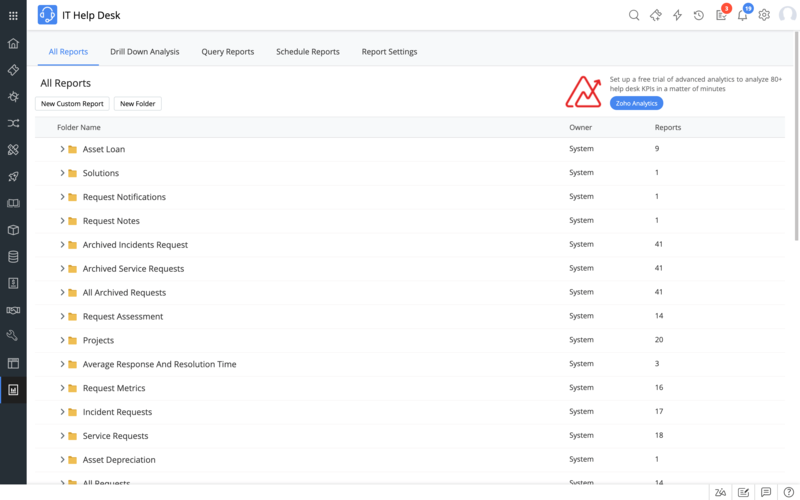 ServiceDesk Plus allows you to report on help desk load, technician performance and SLA violation. You can also use the trend analysis function to identify how problems occurred and how to avoid them in the future. Learn more.. The user survey functionality in ServiceDesk Plus gives you valuable feedback from your users. Such feedback is really useful for helping you to improve your services and ultimately customers satisfaction.